The New Year Fair at Fo Guang Shan Temple, starting January 30 at 6525 Millcreek Drive, Mississauga. 905-814-0465. Free entry. This is my favourite Chinese new year event because it is really out of old China. 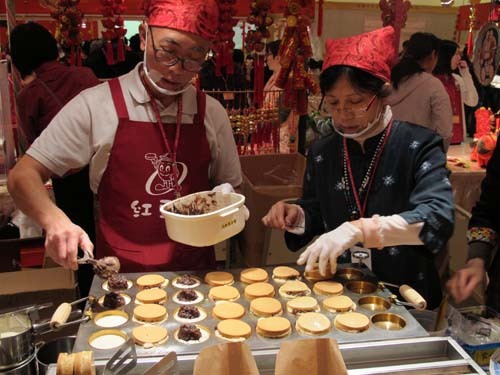 Temple members volunteer at booths full of New Year goodies and take part in dragon dances. This temple also has a traditional New Year’s eve countdown to midnight with the ringing of the temple bell 108 times. Money made goes to the temple. http://bit.ly/1OFhVTq. Fortune telling by Toronto geomancer Paul Ng. Free. For 2016 predictions, see: http://bit.ly/1PEGMqm. For indication of accuracy, see his 2015 predictions: http://bit.ly/1JhxrYS and judge for yourself. Find out your animal sign. Toronto Public Library, Wychwood, Palmerston, Jones, Sanderson and Bridlewood branches. Programs mainly for children. Free entry. http://bit.ly/1S9zzDn. Toronto Canada-China Friendship Association Annual Jiaozi/dumpling-making Party. 4pm. January 30. This is a small group of people celebrating in the old non-commercial way by making and eating these traditional treats together. (Dumplings look like ancient sycee or gold ingots.) Everyone welcome. No previous experience necessary. Downsview United Church, 2822 Keele Street, just north of Hwy 401, free parking. $10. http://bit.ly/1nyP38Q. Door-to-Door lion dances. This is another old Chinese tradition as dancers collect money and lettuce hanging from the top of doorways in Chinese communities. As usual with lion dances, the lion shreds the lettuce and tosses it back to patrons as good luck. The dancers of course keep the money. 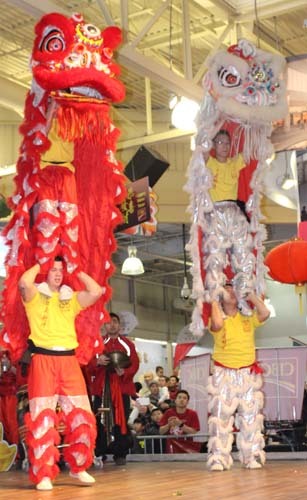 Lion dancers require a great deal of athleticism, especially the “head” of the lion which chews up the lettuce while perched on top of its “back end”. To find these roving bands, just follow the sound of the drummers. Many politicians, Chinese and otherwise, follow the dancers and use the opportunity to pass out lucky laisee packets with a chocolate coin or a candy inside to all within reach. The Guiding Star site list events in Markham where many of Toronto’s Chinese live. http://bit.ly/1CrLXmV. Continue to consult this site as more events are added. One year it listed a wonderful lion dance competition. Mississauga Chinese Centre, 888 Dundas Street East. 905-566-5606. Website not yet updated. 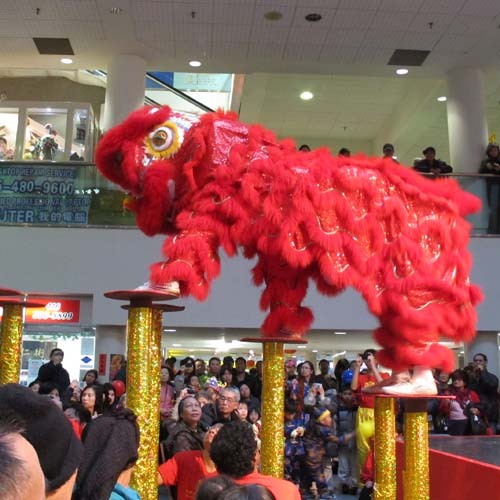 It usually has store-to-store lion dances. http://mississaugachinesecentre.com/. Scarborough Civic Centre. CCAA Lunar New Year Celebration celebrating the Year of the Monkey. East Chinatown at Gerrard and Broadview. Information will be posted below when available. Chinese temples will be specially decorated for prayers; for example, Cham Shan Temple is at 7254 Bayview Ave, Thornhill. Tel. 905-886-1522. Jing Yin temple is at 722 Brimley Road, Scarborough. 416-267-8838. Just leave your shoes at the door, walk in, and tour the sanctuary clockwise. Leave a donation. http://tbjyt.org/schedule_e.html. Kung Hay Fat Choy (Cantonese). Xīn nián kuài lè (mandarin). Happy New Year. The lunar New Year is also celebrated by our Vietnamese, Korean and other Asian communities. Sorry, I missed Tet, the Vietnamese lunar new year celebration which was on January 16. For our blog on its 2014 event, see: http://bit.ly/1nu7O95. Tibetan New Year. The Tibetan Canadian Cultural Centre informs us that Losar this year falls on Tuesday, 9th February. “Tibetans traditionally visit all Monasteries and Buddhist centers that day and it’s called ‘Choejel’ on the First Day of Losar to start the year with blessings. So, the Tibetan Canadian Community Centre will be open to greet Community members for Choejel and we will be serving Tibetan butter tea and traditional losar snack ‘Khabse’ on the day. The grand community gathering for Losar celebrations will be held on the following Saturday, 13th February starting with prayer flag hoisting. The program schedule and details will be confirmed soon.” info@tcccgc.org. http://www.tcccgc.org/contact-us/. Among our Tibetan temples are: Riwoche Tibetan Buddhist Temple, Heintzman Street: http://bit.ly/1nr9PaD and Karma Sonam Dargye Ling, 7 Laxton Ave. Tel. 416-653-5371; tenzinksdl@gmail.com. Website: http://www.ksdl.org/blog/. Korean New Year on January 26. See separate blog for poster. http://bit.ly/1Swwqiq. You can post other free or nearly-free events below. We just learned that Harbourfront will be celebrating the Lunar New Year on February 20-21 with hundreds of life-sized monkeys, musical performances, and craft activities. Of course it will have a traditional lion dance – but in a puppet theatre. For more information and full event listings, please visit harbourfrontcentre.com/lunarfest or call Harbourfront Centre at 416-973-4000. 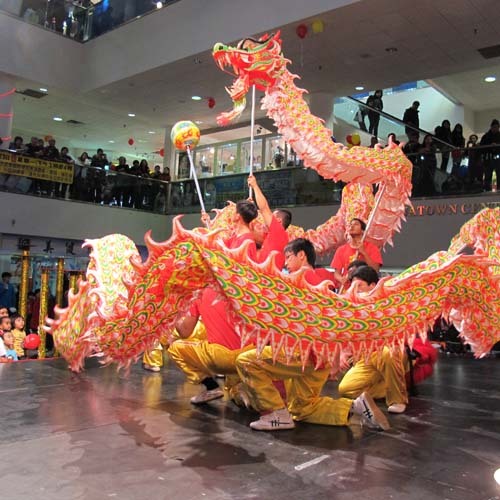 Fairview Mall will celebrate Saturday, February 13 and Sunday, February 14. 1-3pm. Promo Court, on the upper level. Traditional dance & musical performances, martial arts, The God of Fortune, The Monkey King, giveaways and prizes to be won. Free.